Growth is definitely on the agenda for manufacturers. This came through loud and clear in a survey recently undertaken on behalf of Epicor Software Corporation (Epicor) by MORAR Consulting. Our research identified key factors that growing manufacturers cited as essential to their success, along with risks that manufacturers believe could threaten growth for the unprepared business. 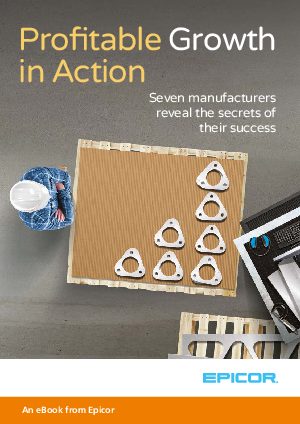 In the “Profitable Growth in Action” eBook, Epicor compiles seven stories from manufacturers around the world, illustrating how the Epicor enterprise resource planning (ERP) solution is helping them leverage these success factors and grow effectively—without falling prey to the risks of growth.